Marble Mixer is a local multiplayer physics-based marble flicking game where you can play in 3 different minigames with different game play styles. 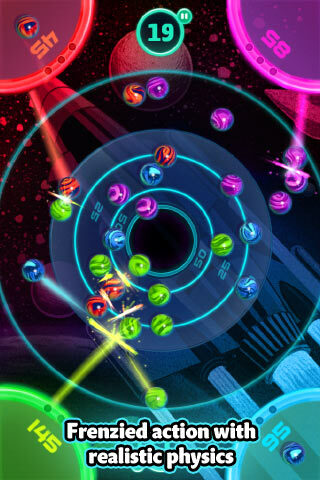 Marble Mixer is priced at $0.99 released by GameHouse and is available for iPhone, iPod touch, and iPad. This is one of the first multiplayer games I’ve seen that isn’t online-capable. You have to hold your iPhone with another person, or up to 4 people, just to play these minigames. Basically, you have 3 game modes and each one has a different feel to the action. First that I tried was Table Tactics. This is a more careful and precise game of trying to roll a marble right onto some high-scoring zones on a circle. The closer to a hole in the middle you get without falling in will result in a higher score. This game was the least fun that my girlfriend and I had during our tests simply because it was more difficult to be precise. You take turns flicking marbles and try to collect the highest score of all the players. You can knock your opponent’s marbles off the map, but it doesn’t do anything. Second is Space Mania, which sounds like I should be contracting pandorum or something, which is the exact same roll-onto-score zones style of game except now it’s far faster. You now have unlimited marbles and you and your opponent can flick as often as you want. You land on points and where the marble stops is the points that get added to your score, then your opponent can score points by knocking your marbles into the big hole in the center. It’s quick and really feels more like a competitive game. You can score bigger just knocking your opponent’s marbles off then trying to roll onto the high score zone right around the hole, but it’s risky and you could end up wasting your roll. 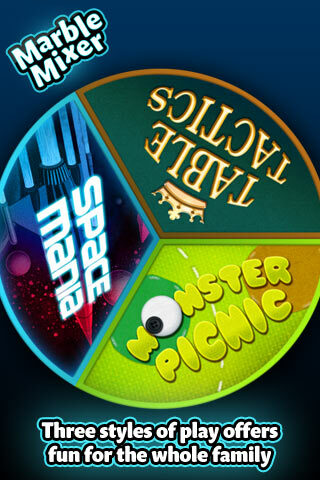 Finally, you have Monster Picnic, a favorite of my girlfriend. This is the most fun game in my opinion and it’s because it does away with trying to land on score zones. In this one, you are actually trying to land into the hole… with the hole being the mouth of a big bear-like circle in the center that rotates. You try to flick the marbles into the monster’s mouth which will get you points. You and your opponent can now frantically try and flick the highest amount of marbles into the mouth. The best part of this one is that failed flicks that land on the monster’s face can later be knocked into the mouth by flicking very hard into them. They will realistically roll into the mouth if you hit them hard enough and you’ll collect points for them. This is fun, fast paced, and doesn’t require full precision. The sound is average since tere isn’t much distinctiveness in the background music or the sound effects. The graphics are nice and bright with lots of colorful marbles. You can upload your scores to Facebook leaderboards. The different levels all have very distinct art styles and the physics-based gameplay of flicking marbles is surprisingly accurate once you get used to it. Overall, it’s a perfectly functional game. There are some aspect that I feel can be improved upon. Firstly, after you win a round of marble flicking, you get a badge or some kind of counter for winning. This badge will actually block the score board so you can’t read scores sometimes. This happened each time the player on the right side of the screen (from bottom or from the top) wins the round and it’s quite weird. I sort of feel like the score board needs to be moved or the badge thing should be moved to a different area. If you have kids or siblings and want to play a game with them using online local multiplayer this game works great. The addition of online multiplayer can improve this game, especially for people who want to play alone in the backseat or waiting on the bus or in a line for a movie. Adding the ability to control difficulty levels would make the game more exiting when playing against the CPU as well. Overall, Marble Mixer is great if you can find 1 or 2 people to play with. Nice graphics and functional physics and two out of three of the games will definitely entertain you. This game a quality game and can be drastically improved with online multiplayer support. AppSafari review of Marble Mixer was written by Joseph Ho on August 21st, 2010 and categorized under App Store, Games, iPad apps, Mini Games, Multiplayer, Physics Based, Universal. Page viewed 4126 times, 1 so far today. Need help on using these apps? Please read the Help Page.